Update 2018: Yamaha P-115 has been replaced by the new model P-125. Read my Yamaha P-125 review here. Yamaha P115 88-Key Weighted Action Digital Piano is a great piano for a person looking for a good sound coupled with a professional feel. I like this Piano because it is a full sized piano which makes it easy for me to play all types of music. The first time I played P115, I observed that it has a higher polyphony (192 notes!) compared to other digital pianos. This makes it easy for me to combine many notes and keys while playing. This great CF sound engine produces a sound that is similar to the Yamaha 9 CFIIIS grand piano. Another reason why I like this piano is that it has a dual mode feature which allows me to play two instruments at once, a split feature – to split keyboard into parts playing different instruments, and a “mirror” mode – splits keyboard into identical two parts with the same instrument – it helps me when playing with a student who needs to play along. 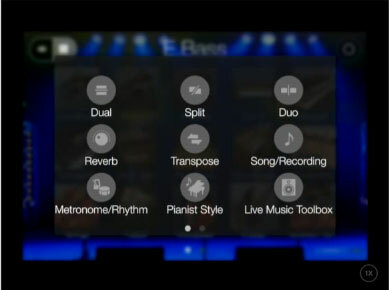 In addition to this, the piano has a controller app that is compatible with ios devices (using “Digital piano controller” app you can manage different functions of your P115 using your iPhone or iPad). The piano has line-level auxiliary outputs which allows me to play into mixer with other instruments in the band. It also comes with a USB port with which I pair with software on my computer in order to make recordings. Moreover, the digital piano comes with a wide variety of in-built songs. There are several other reasons why I love the Yamaha P115. One of them is that the piano produces a beautiful sound and has four levels of touch sensitivity. This allows a pianist to enjoy a dynamic and expressive playing. Graded Hammer Standard (GHS) 88-key keyboard action means that keys are lighter on the top and heavier in the low end – just as on a real piano. Pianist style auto accompaniment is also a nice feature – when playing chords the keyboard acts as an accompanist playing a specified pattern thereby leaving my hands free to create more melodies. On Amazon you can buy this digital piano with some extras, such as Yamaha L85 keyboard sturdy stand and a pedal unit. The construction of the piano is aesthetic, which adds more beauty to the home. This digital piano is suitable for multiple scenarios. I love the fact that I can connect my headphone to it. This ensures that I can practice at anytime of the day without disturbing my neighbors. Moreover, when playing the piano, I have the discretion to switch between the four levels of touch sensitivity depending on whichever suits me. To cap it all, the digital piano has a sound boost feature which ensures that the sound produced by the piano stands out among other musical instruments. By all standards, the Yamaha P115 is one of the best digital pianos for a professional pianist at a reasonable price. Check out and buy black or white version of P115 on Amazon. A realistic sound that looks more like a grand piano than a nearby standing bright piano. The keyboard is like a real piano. The included pedal is no good. I also purchased L85 stand with a pedal unit. It works ok, but the triple pedal unit is made of plastic and one of the pedals creaks. Good loud built-in speakers, no need to buy external. Two outputs to the headphones, you can play alone in silence. Good sound, the keyboard is close to the original, not noisy. Very laconic design with a minimum of buttons on the case. The consequence of a minimum of buttons on the body – almost all settings are made through the main keyboard, which you need to get used to. The music stand is not quickly detachable, once it’s set it’s hard to pull it back. Bare it in mind If you need to travel with P115. I have been trying to record the audio (not MIDI) output into my laptop through Audacity, without investing in an USB Audio Interface like Focusrtite Scarlett or Behringer UMC22 or Presonus audiobox etc. My laptops have only one 1/8″ (3.5 mm) sound input (mic+headphone). I have tried direct recording both from Aux o/ps and headphones. Did not work. 2 days back, I got myself a product like this https://www.amazon.com/Sabrent-External-Adapter-Windows-AU-MMSA/dp/B00IRVQ0F8?tag=digitalguid0a-20, which is like a cheap audio interface. But still I can’t record. The aux o/p give either radio silence with a very low vol high freq sound. The headphone output contains very very faint piano sound drowned in HUGE line noise. I have been trying to record for six months now, but have not been successful. Can you help? If you didn’t manage to record on any device, maybe the output on your Yamaha doesn’t work? Or there is some problem with the cable?